This afternoon, Austin City Council passed a resolution establishing a community wide goal of achieving net zero greenhouse gas emissions by 2050. This is one of the most ambitions emissions reduction goals in the world and was passed in response to the recent reports from the Intergovernmental Panel on Climate Change‘s (IPCC) most recent reports, which indicate that climate change is progressing more rapidly than projected. The resolution will set in motion a process of updating the city’s current Climate Protection Plan to include all emissions from the Austin community, not only those from city departments – a major improvement over the existing Austin Climate Protection Plan. The resolution also acknowledged that cutting emissions in the near term will have greater impact on reducing climate change, than emissions cuts closer to the 2050 deadline. This is because carbon dioxide emissions will continue to impact the global climate centuries after they enter the atmosphere. The ultimate goal of having net zero greenhouse gas emissions was established to ignite creative ideas in the community and to serve as an inspiration to other cities. 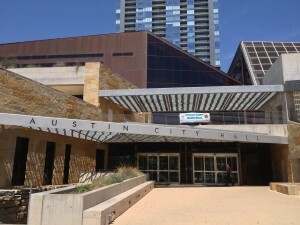 Austin has long been considered a leader in renewable energy and other environmental efforts, but Council recognized that other cities were now establishing more aggressive emissions reductions targets and took this opportunity to help Austin maintain its leadership role. The resolution called for public participation in developing the new Austin Climate Protection Plan and established that boards and commissions, as well as other technical advisory groups should be consulted. The first deadline established in the resolution is September 1, 2014, when the City Manager will be responsible for presenting City Council with a framework for meeting short and long term emissions reductions goals. The final community wide Climate Protection Plan is to be presented to City Council by March 1, 2015. By then the new 10-1 City Council will be in place. In the meantime, the Austin Energy Resource, Generation, and Climate Protection Plan update will continue and could include improvements to Austin Energy’s climate protection goals. The Austin Energy Resource Generation Task Force will have it’s first meeting at 3:30pm on Wednesday, April 16. 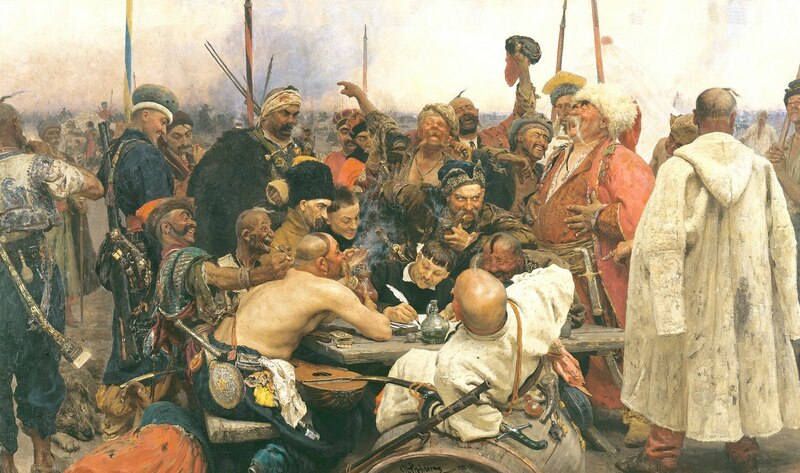 That meeting, and all subsequent Task Force meetings will be open to the public. Councilman Riley sponsored the resolution with Councilman Spelman and Mayor Pro Tem Cole as co-sponsors. The resolution passed on a 6 to 0 vote, which only Mayor Leffingwell voting against it. The resolution passes with no fanfare, but the sponsors will host a press conference with community leaders tomorrow morning to announce this encouraging progress. SB 875 – BAD BILL ALERT: Call your Rep now!! The House passed on 2nd reading a bill which would give polluters a shield against being sued for nuisance over their greenhouse gas emissions. Unfortunately, greenhouse gases include all sorts of bad pollution, like methane, and even the pollutants that cause smog: NOx and ozone. Even worse, there is concern that the Bonnen amendment would apply to every area of the state of Texas water code. This is a bailout for polluters and would take away your rights to stop emissions in your backyard that affect your family, your home, your farm, or ranch. They say this is just about global warming, but it’s not! The original bill was a bad concept, but it only limited local governments’ right to bring nuisance or trespass lawsuits for greenhouse gases. The new version significantly expands the scope of the bill and TAKES AWAY PEOPLES’ (INDIVIDUALS, FARMERS, RANCHERS, BUSINESSES AND LOCAL GOVTS) RIGHT TO PROTECT THEIR PROPERTY FROM POLLUTION. Senate Bill 875 by Sen. 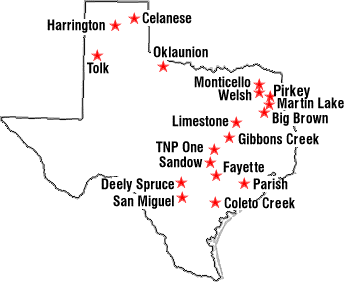 Troy Fraser (R-Horsehoe Bay) would take away a Texan’s right to sue a company for “nuisance” or “trespass” resulting from greenhouse gas emissions if that company is compliant with air emissions permits issued by Texas Commission on Environmental Quality or an agency of the federal government. The bill would roll back Texas nuisance law that predates the Clean Air Act, protecting businesses that emit greenhouse gases from enforcement actions, civil lawsuits or criminal claims. The Texas Chemical Council, Association of Electric Companies of Texas, Texas Association of Business, Texas Association of Manufacturers and Texas Pipeline Association and other business groups back the bill, but environmental groups oppose the measure. The bill is designed to put a halt to a trend of public nuisance claims as a way to regulate greenhouse gas emissions. Although the EPA has announced plans to issue rules governing greenhouse gas emissions, air quality permits held by Texas businesses do not currently regulate greenhouse gas emissions. Our ownTom “Smitty” Smith of Public Citizen’s Texas office, testified against the bill in committee, telling the committee that greenhouse gases are effectively a nuisance because they can cause adverse health effects, change the fertility cycles in plants and animals, and require retrofitting of roads and bridges to withstand greater temperatures. The bill would take away a legal tool citizens have used that predates the Clean Air Act and one that has been used by citizens to sue oil and gas companies. Smitty further testified that if the standards are unclear, the fallback position you have is nuisance. It interferes with your enjoyment of the environment or causes health effects making the bill far more nefarious than it appears on the surface. Even the TCEQ has reported that the bill could “hamper the agency’s ability to cite a nuisance violation for greenhouse gases” and allow the “nuisance” to persist and result in lower revenues from penalties, according to the bill’s fiscal note. Bill by bill, this legislature seems intent upon whittling away protections for individual Texas citizens in favor of the rights of industry. At a time when in much of the US we are facing the most significant heat waves in decades, global temperature averages have shown 2010 to be the hottest year ever in recorded history, the National Oceanic and Atmospheric Administration / Climactic Data Center just released its most comprehensive report on climate change which may as well have been called “It’s Real and It’s Here: NOW!”, and droughts, heatwaves, and wildfires are causing Armageddon-like conditions around Moscow, causing even the global warming denying Russian government to capitulate to the scientific consensus….. Even with all of that, it would seem like an odd time for the state of Texas to send a shot across the EPA’s bow, insulting them and goading them into a fight over Texas carbon emissions and the Clean Air Act. Monday August 2nd the state of Texas sent a letter to the EPA (original can be downloaded here) informing them that we would no longer be complying with the Clean Air Act, specifically provisions relating to the regulation of greenhouse gases. This letter signed by Attorney General Greg Abbott and TCEQ Commissioner Bryan Shaw is full of bluster and short on reasoned legal arguments with any real merit. Tomorrow, Thursday June 10, Sen. Lisa Murkowski’s (R-Alaska) “Disapproval Resolution” will be voted on in the Senate. If passed, it would overturn the EPA’s “endangerment finding”, undermining the Clean Air Act- which by the way is the most successful piece of environmental legislation- and stripping the EPA of its right to regulate Greenhouse Gas emissions. Congress has the audacity to claim that global warming is their domain, not the EPA’s. If this is true, it’s baffling that the EPA has been taking action to curb greenhouse gas emissions while all the Senate has done is sit on greenhouse gas legislation. Murkowski’s resolution, because it will be voted on under the Congressional Review Act, only needs 51 votes to pass the Senate and move on to the House. Murkowski has already locked in 40 co-sponsors and is not revealing how many additional votes she has secured. But while she might get her resolution through the Senate without too much sweat, getting enough votes in the House and the approval of the White House- Obama has already threatened to veto it- promises to be more of a challenge. This is not the only bill that those of us in favor letting the EPA protect our clean air need to keep our eyes on. Sen. Jay Rockefeller (D-W.Va.) will try to push his own bill, which if passed would block the EPA from regulating the greenhouse gas emissions from stationary sources such as power plants and oil refineries for two years, through the Senate. He needs 60 votes and is less confident about its getting through the Senate, but either way, he has said, he will vote in favor of Murkowski’s resolution. I am writing as former EPA Administrator under the Nixon and Ford Administrations to urge the Senate to oppose any legislative proposals that would undermine the Clean Air Act. In particular, I ask the Senate to reject the Resolution of Disapproval offered by Senator Lisa Murkowski of Alaska (S.J.Res.26), which would prevent the EPA from acting on that agency’s endangerment finding and the cause or contribute findings for greenhouse gases. For 40 years, the Clean Air Act has protected the health and welfare of the American people, saving hundreds of thousands of lives while vastly improving the quality of the air we breathe. The economic benefits provided by the Act have exceeded its costs by between 10 to 100 times over. *Note: Tyson Slocum is delivered this statement today at a public hearing held by the U.S. Environmental Protection Agency on regulating greenhouse gas emissions from new and existing industrial facilities under the Clean Air Act. As we approach the 40th anniversary of the Clean Air Act, it is appropriate for the Environmental Protection Agency (EPA) to use this law for the agency’s most important and challenging task yet: solving climate change. Decades of success using the act to make America’s communities cleaner and safer can serve as a model of how to tackle climate change. 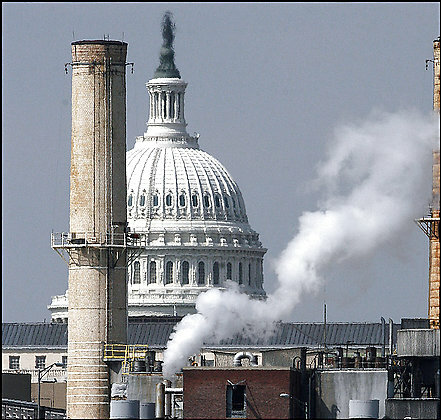 Public Citizen supports the development of strong, science-based regulations to sharply reduce greenhouse gas emissions from power plants, oil refineries and other “smokestack” emitters responsible for 70 percent of our nation’s emissions of pollutants that cause climate change. The EPA has emerged as the only arm of the federal government with the credibility to solve climate change, as Congress thus far has produced deeply flawed legislation that provides billions of dollars in financial giveaways to polluters while failing to fix our corporate-controlled energy system, which contributes to unsustainability and pollution. Most unsettling is the fact that climate legislation passed by the House of Representatives would end the ability of the EPA to regulate greenhouse gas emissions under the Clean Air Act. Public Citizen understands why polluters’ lobbyists have tried to eviscerate the EPA’s authority: Because they know that the agency now is largely shielded from the influence of corporate special interests and can therefore concentrate on formulating the regulatory solutions to climate change based on science, not politics. As world leaders prepare to meet in Copenhagen next month to discuss how nations can work together to solve climate change, the eyes of the world will look not to Congress, but to the EPA for leadership. Public Citizen strongly supports the agency’s efforts to use the full extent of the Clean Air Act to implement science-based regulations to sharply reduce America’s greenhouse gas emissions from new and existing industrial sources. For any of you global warming denier trolls lurking out there, here you finally have it: ANOTHER final study that undeniably shows a link between manmade greenhouse gas emissions and the warming that has occurred. Until now, it has been difficult to estimate how much climate will warm in response to a given carbon dioxide emissions scenario because of the complex interactions between human emissions, carbon sinks, atmospheric concentrations and temperature change. Matthews and colleagues show that despite these uncertainties, each emission of carbon dioxide results in the same global temperature increase, regardless of when or over what period of time the emission occurs. These findings mean that we can now say: if you emit that tonne of carbon dioxide, it will lead to 0.0000000000015 degrees of global temperature change. If we want to restrict global warming to no more than 2 degrees, we must restrict total carbon emissions — from now until forever — to little more than half a trillion tonnes of carbon, or about as much again as we have emitted since the beginning of the industrial revolution. The full article will eb published in the June 11 edition of Nature. Just how bad has the coal ash situation gotten in the United States? So bad that the Department of Homeland Security has told Sen. Barbara Boxer (D-Calif.) that her committee can’t publicly disclose the location of coal ash dumps across the country. The pollution is so toxic, so dangerous, that an enemy of the United States — or a storm or some other disrupting event — could easily cause them to spill out and lay waste to any area nearby. There are 44 sites deemed by the Environmental Protection Agency to be high hazard, but Boxer said she isn’t allowed to talk about them other than to senators in the states affected. “There is a huge muzzle on me and my staff,” she said. “Homeland Security and the Army Corps [of Engineers] have decided in the interests of national security they can’t make these sites known,” she said. There are several hundred coal ash piles across the nation, she said, all of them unregulated. “If these coal ash piles were to fail they’d pose a threat to the people nearby,” she said. While keeping it from the public, DHS is alerting first responders as to the location of the piles. (Austin) Senate and House members from both political parties showed unprecedented support for developing more renewable energy and energy efficiency in Texas by filing a large number of clean power, green jobs bills in the 81st Texas State Legislature. A number of major bills passed either the House or the Senate. Ultimately, political disagreements over other issues and over the size and extent of the programs delayed and killed most of these excellent legislative initiatives. 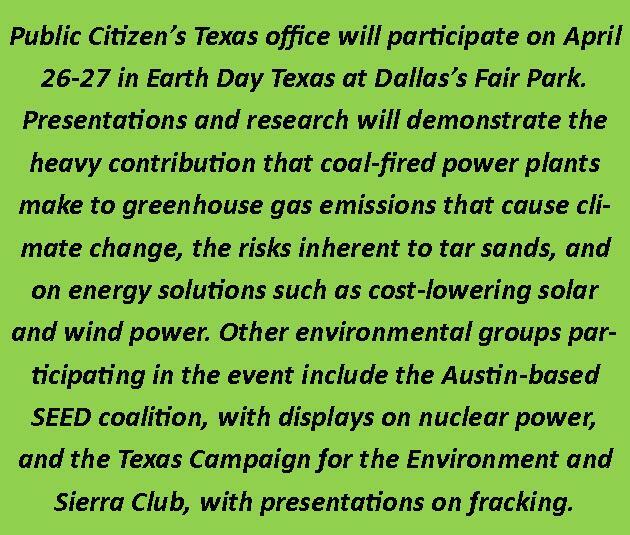 Environmental groups Sierra Club, SEED, Public Citizen, Environmental Defense Fund, and Environment Texas applaud the passage of some clean energy, green jobs legislation and view the Legislature as having laid ample groundwork for the future. Legislation allowing cities to create financial districts to loan money for renewable power and energy efficiency (HB 1937). A coordinated green jobs strategy including funds allocated for child care programs, vocational training initiatives, energy efficiency measures, the Weatherization Assistance Program (WAP), and/or any other recovery funds (passed as a Rider to Article 12). Green fee bill passed allowing governing board of public colleges and universities to institute an environmental service fee once approved by student body election. Creating a $500 million solar incentive program (SB 545 – passed the Senate). High performance energy efficiency building standards for state buildings, including universities and public schools (HB 431). The Senate may pass the conference committee report today, on Sine Die. Opposition from the Texas Manufacturers Association, the Governor and many utilities against the Renewable Portfolio Standard. “Moreover, the Texas Association of Manufacturers (TAM) while acknowledging that an expanded renewable portfolio standard was the way to bring clean technology jobs to Texas, distributed false cost information about solar legislation that was repudiated by the PUC and others. The bottom line, TAM fought legislation that would have brought new manufacturing jobs to Texas,” said Marston. Environmental groups blocked bad bills that would have removed citizen rights to contest permits and would have promoted nuclear power in the State which many view as a financial drain from investment in truly clean energy. “Nuclear power is expensive, consumes vast quantities of water, comes with serious security and health risks and creates radioactive waste, for which there is no good storage solution. We were happy to block two bad bills this session that were designed to benefit proposed nuclear reactors in Texas,” said Karen Hadden, Director of the Sustainable Energy and Economic Development Coalition. A good bill to address the Compact Loophole for the Andrews County Low-Level Radioactive Waste Dump bill, HB 3423 Lon Burnam did not get out of Committee. 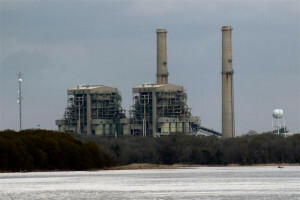 Environmental groups blocked a bad provision that would have fast tracked water permits for “clean coal” plants in the final version of HB 469 and added cleaner emissions standards for those plants. HB 821 passed, requiring television manufacturers that sell televisions in Texas to make free and convenient recycling available. 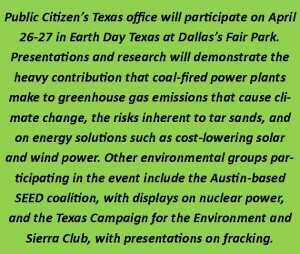 Texas Campaign for the Environment successfully advocated for this bill. SB 2169 Sets up an interagency working group, co-chaired by the Texas Commission on Environmental Quality, the Texas Department of State Health Services, the Texas Department of Transportation with other agencies to discuss smart growth and make recommendations for developing the state in a sustainable way. An amendment to HB 300 creates a certification program for environmental coordinators in Texas Department of Transportation district offices. This bill is still in conference committee as this release goes to press. The first step towards greenhouse gas regulation is underway! On Wednesday, the EPA proposed a rule that industries measure and report their greenhouse gas emissions. The rule would apply to 13,000 facilities nationwide, including manufacturers of chemicals, oil, cement, iron and steal, automobiles, electricity generation, and more! Green Inc reports that this will cover 85%-90% of greenhouse gas emissions in the United States, and not just carbon dioxide emissions. The reports will also include emission amounts of those other things we hate to inhale, such as methane, hydrofluorcarbons, and nitrous oxide. If put into action, emissions tracking will begin in 2010 for reports to release in 2011. Of course, this program would cost a significant amount of cash—$160 million in the first year and then $127 million each year thereafter. The reports will allow us to pinpoint exactly how much greenhouse gas is released into the atmosphere, and from where. Though some firms are already participating in voluntary reporting, this kind of industry-wide reports will provide comparative analysis. With such detailed (and presumably accurate) information, we will also be in a better position to make informed decisions about how emission regulation should be formulated. CNNMoney.com also reported that this information could be important to investors. For those ill-prepared companies, emission regulation could drastically affect their earnings. The SEC needs to protect investors from the risks companies face from climate change, whether from direct physical impacts or new regulations. Shareholders deserve to know if their portfolio companies are well positioned to manage climate risks or whether they face potential exposure. Public release of information would be a powerful tool to prepare companies, especially those that are energy-intensive, to be held accountable for their energy emissions. Or a good kick in the pants to take the next step to become ecologically conscious! 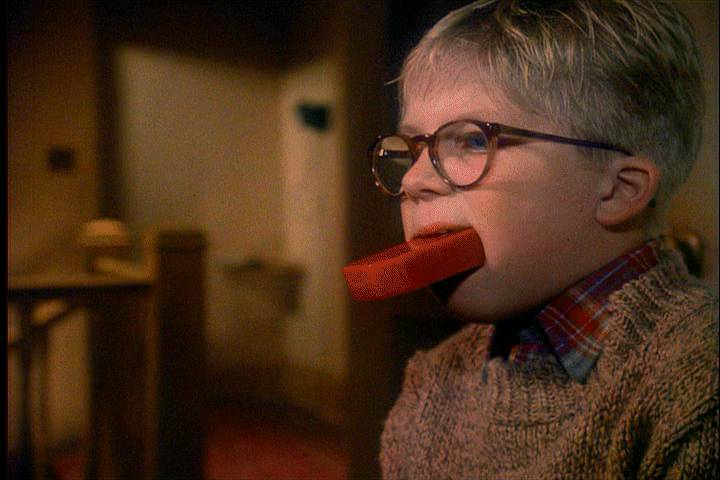 The EPA’s newest decision definitely brought the dreaded “F-dash-dash-dash” word to mind. Coal-fired power plants’ greenhouse-gas emissions shouldn’t be taken into consideration when determining whether to approve their construction, EPA Administrator Stephen Johnson ruled this week. The ruling could clear the way for at least a handful of new coal plants to be approved in the final days of the Bush administration. “The current concerns over global climate change should not drive EPA into adopting an unworkable policy of requiring emission controls,” Johnson wrote. Just as I was getting into the holiday spirit, Stephen Johnson has to hit us with this. In case you’re not quite as obsessed with carbon dioxide regulation and coal plants as we are here at Texas Vox, let me provide a little background. In November the EPA’s governance board ruled that its regional office had been too hasty in approving a new coal-fired power plant in Bonanza, Utah because the plant didn’t include carbon dioxide emissions or control techniques in their permit application. The Sierra Club helped secure this victory by filing a suit against Utah’s Deseret Power Electric Cooperative for not controlling carbon dioxide. Their argument was based upon the landmark Massachusetts v EPA case, which required the agency to regulate CO2 as a pollutant under the Clean Air Act. The Bonanza decision was, in a word, wicked awesome (okay, two words). It gave environmentalists a great new tool for stopping coal-fired power plants and signalled a sea change in the government’s willingness to take action over carbon dioxide emissions. So the fact that the EPA is now telling permitters that they cannot consider greenhouse gas emissions when processing applications is a major kick in the pants. It could mean slated plants that wouldn’t have been approved could get the green light during these last weeks of the Bush administration. In a New York Times article, Vickie Patton, from the Environmental Defense Fund estimates that as many as 8,000 megawatts of new coal-fired power plants could skate through as a result of this ruling. I’m still rather uncertain of what this decision means for the incoming administration. Lisa Jackson, Obama’s new pick to head the EPA, is considerably more progressive on greenhouse gas emissions than Johnson, and could theoretically reverse this decision. It was unclear yesterday what the ruling’s real-world impact will be. The EPA says that about 50 plants — either new or significantly remodeled — must obtain a permit under this provision every year. But Meyers said he does not know if any are positioned to receive final approval before President-elect Barack Obama takes office on Jan. 20. The Obama administration is likely to review the case, and Democratic officials close to the president-elect’s team say that the Supreme Court ruling and the EPA’s power to regulate carbon dioxide can serve as powerful levers to bring corporations and other parties to a bargaining table about broad framework for controlling greenhouse gases.